HighVelocity Paintball is an online 2D multiplayer client featuring realtime games with real people from all over the world. Our games are class-Based which gives our players the opportunity to customize their character into one of the 8 different classes. Each class has its own special attributes which gives it a slight advantage against some other classes. Lead a simpler, funkier life on the Funky Farm. Make money raising livestock so you can spend it at the general store. Keep your sheep safe from wild wolves by keeping them in flocks, building fences, and protecting them with a sheepdog. Fatten up your pigs so they're worth more money... but watch out! Those porkers will knock down anything or anyone in the way of their supper! Onimod Land is a RTS-game. The game has a smart artificial intelligence and original way of managing. You may choose the race of savages or space occupants for the game. The game is more oriented to the hard fighting than to the development. At the present moment the game has 5 campaigns and 30 single maps. The net game supports up to 8 players. You can define any political unions. Kristanix Yatzy offers two different types of the game yahtzee. The regular game with five dice, and a special extended version with six dice and more categories to put points in. Don't want to play alone? 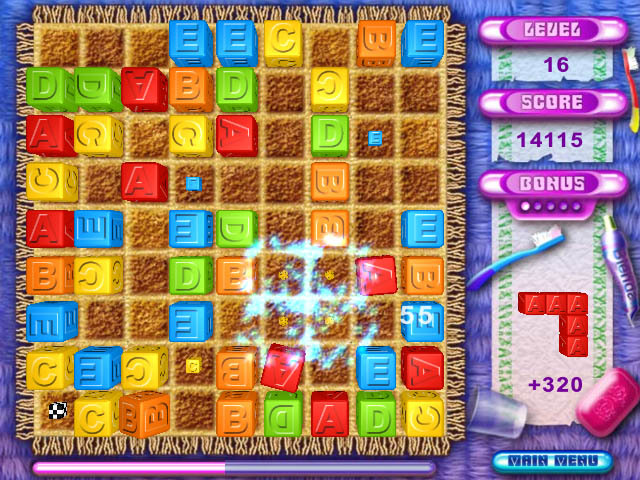 The game supports up to four players simultaneously. A highscore list keeps track of the best (or luckiest if you will) yatzy players. Both English and Norwegian interface. A naughty kid left a heap of colorful cubes on the floor and your job is to clean up the mess now. To do that you will have to arrange them in a certain order. But the little rascal will be throwing new ones in as you try to clear them away. However there are many bonus features that will help you cope with the task. The game is all in 3D, features innovative graphics and has lots of special effects. Be careful: it’s very addictive! Do you have the skills to find the hidden words in a world of tumbling tiles? Quick thinking and even quicker clicking will help you with this mindbender. Take too long searching for the right combination and you'll be asking yourself, what's the Wordo? Infiltrate your opponent's camp and capture the three colored squares on the field behind him. But be careful: your opponent can take over your pieces just by boxing them in, and suddenly his army is larger than yours. Oh, did I mention that your pieces can't retreat? 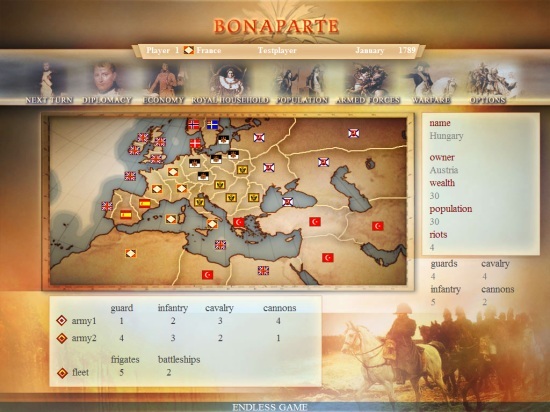 BONAPARTE - THE BATTLE FOR POWER AND FREEDOM We're back in the year 1789, the French Revolution has just begun. Now you're getting the chance to step into Napoleon's shoes. Chose one out of 5 nations (France, Prussia, Austria, Russia or Great Britain) and lead them through the oncoming 70 years. 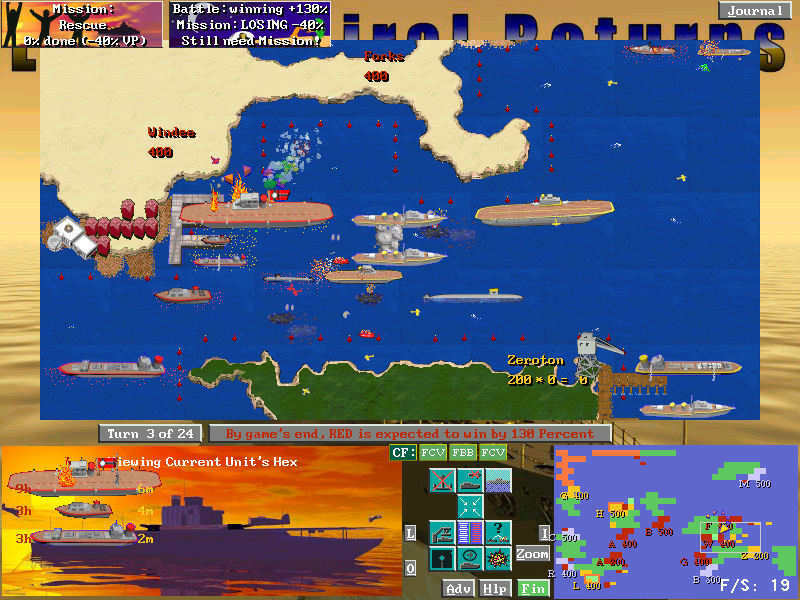 1 to 5 players may play from one computer. Furthermore, you may re-play historical scenarios. Cyberscrub is a professional data eliminator that is specially designed to protect your internet privacy. The software erases cache, cookies, history, typed URL, index.dat, email history, pictures and recent used applications. CyberScrub is also able to completely destroy any data from previously deleted files that might still be accessible, and makes sure that all your sensitive information is deleted in a non-recoverable way. Gazillionaire is the award winning game of business strategy. It was selected as a FINALIST in the Ziff-Davis Shareware of the Year Awards and was ranked in the Top 5 of all strategy games. Gazillionaire is a cross between Monopoly set in outer space and Wall Street in wonderland. It is a wild, intergalactic game of business strategy. Sophisticated real-world economic tools help you determine where supply meets demand. Do you bet on NFL games or think about doing it? The line between winning and losing money is a very narrow one and depends on skills, rather then luck. This program teaches you the basics and test your betting strategy. It's the only professional betting simulator for NFL games based on real statistics. Point spreads, game totals, money line. 100% FREE download! Family BINGO is the classic game of BINGO that can now be enjoyed by the entire family and now it Speaks. The interface has been designed to accurately portray the traditional BINGO game you know and enjoy. Using your PocketPC, you can also enjoy the freedom of playing BINGO and having the PocketPC actually speak the BINGO Letter and number. Print BINGO cards from your PC's Printer in 3 different sizes.